The last Sunday was an exceptional day for graduates of the year of study 1967/68. Over thirty persons received honorary diplomas of our University renewed after five decades. The ceremony was held in the auditorium of the main PUEB building. 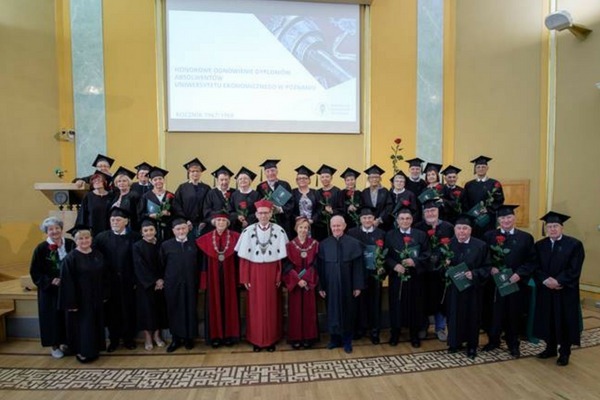 36 graduates of the General Economics Faculty of the then Higher School of Economics in Poznań, year of study 1967/68 and their relatives took part in the event. Professor Bogdan Godziszewski, representing the group not only recalled student time spent at the University, its lecturers at that time and the most interesting stories of student life but also, in the group of peers, commemorated those who had already left us. The attraction of the ceremony was the performance of Sonantes female choir and the event was concluded by a guided tour of the palace district of Poznań prepared for the graduates.